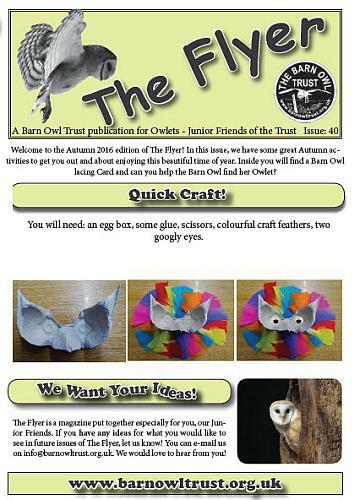 Free copies of ‘Flyer’ – our kid’s newsletter – Owl facts, puzzles, jokes & stories. Our education pages are designed for children at key stage 1 and 2. However, there are ideas and activities included that make some parts suitable resource material for older and younger children too. The materials can be photocopied for use in schools on the understanding they are copyright of the Barn Owl Trust. The resources are split into 3 key areas with ideas for lesson planning and a selection of worksheets available for each. The resources are designed to complement the Wings of Change story, which we deliver in schools across the South West, or is available on DVD presented by Nick Baker. If you are using our resources independently of seeing the Wings of Change DVD or a Barn Owl Trust school visit, then reading the Wings of Change story is an excellent starting point. Download the Wings of Change story in brief. Our resources also work well as part of other topics such as food chains, adaptations and habitats, nocturnal animals and classification or why not base a whole topic around owls and other birds in general? To get you started, have a read through our About the Barn Owl leaflet and colouring sheet for a general overview of Barn Owls. Download the About The Barn Owl sheet. We hope that working with our educational resources will inspire you and the children you work with, and that it will encourage an increasing interest and awareness of both Barn Owls and the countryside. Each PDF file is designed to be used independently, or alongside other materials to enrich a topic plan, taking the Barn Owl into each area of the curriculum.